Rockman Corner: Rockman X3 Prototype Version Released! Rockman X3 Prototype Version Released! After what seems like forever, we have successfully ripped a playable dump of the Rockman X3 prototype/SAMPLE version. Good on our word, it's now available to be played, dissected and researched to your heart's content. The file can be found by clicking on a certain green button on the right side of this blog. You know, the same button where all the other betas & protos are. It's right there. 00DA390B enable once X starts automatically walking after defeating Sigma and then disable once he reaches the wall in order to enable the cutscene of Zero using his antivirus attack on Sigma. With that out of the way, you're good to go. A little background on this for those just catching up: the build date for this prototype is August 23rd, 1995 - that's about four months before the game hit retail. The differences here are mostly graphical, i.e early stage backgrounds and early sprites. 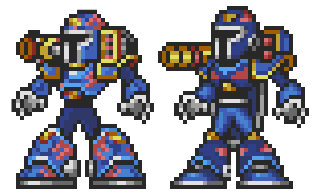 For example, pictured above is a comparison between Vile and Byte's prototype and retail sprites. Vile's prototype sprite is remarkably better than the final version; much more faithful to his official artwork! There are other prototype elements, too. The unused ceiling boss gate in Blast Hornet's stage - previously seen on the back of X3's U.S box - is fully operational. Further, the white trim of X's armor changes color based on the enhancement chip you currently have equipped - a feature *entirely* missing from the final game! There's plenty more differences and oddities to be found. You'll have to play and poke around for yourself! All future findings will be cataloged at The Cutting Room Floor, FYI. Anyone and everyone is invited to contribute. Let me emphasize it took a tremendous amount of effort to get the prototype in a playable state. The Cx4 chip on the prototype EPROM was a bit different than the retail X3, if you recall. It required a specific flavor of hardware - a Super WildCard DX2 and an Arduino reader - to produce a playable dump. Procuring these devices wasn't easy (nor cheap) so we're truly thankful for everyone that's shown us patience. Thank you very much! This is an amazing gift for my collection. you are great!! Yay! I'll probably try this out later. Thank you! You do keep your promise. We thank you for being honest with us. You are indeed a good person! Now, I have all collection. Hope there is more prototype for Megaman 3, Megaman 4. Those two are missing. That was a fun romp. One neat thing I found (don't recall seeing it in the videos) is that the enhancement chips give you different coloured armor depending on which one you get, similar to how the gold armor in this gives a black and blue colour instead. Yup, that is what happens. Curious that they removed that feature. could you take some screenshots of video of this? It would be amazing, thanks if you can! My personal favorite is the Arm Chip color scheme. BIG Thanks to CD.21.21 CD.21.21 for acquiring the cart and sharing it! I really want to show my appreciation for all the work that went into making this possible. Thank you, everyone, who was involved! From the people who physically made it happen, to the patient fans like me who gave encouraging words as we waited for news, you're all awesome. And ya know... I find it funny that this came out a day after Mega Man X3 hit the US Virtual Console stores. The timing was pretty good for interest in this specific title! First of all, thanks a lot for the effort for bringing this treasure to all fans. You guys have my gratitude. It is my hope that one day, Mega Man Mania (A.K.A. Anniversary Collection Advance) will be dumped. Thank you, thank you, thank you. I can't thank you guys enough for this wonderful achievement. Also, whoa I. Tracer has the Wily symbol. A "W" bar. Seriously. In EVERY SNES X game. It's actually for X's buster! You can see it in the tile viewer and it's replaced whenever X switched weapons. Interestingly enough, beta screen shots show a "P" bar for X's Power bar. This particular bar came from X3. So basically, it's the icon that shows up when the game has no idea what icon it should be displaying for a weapon. 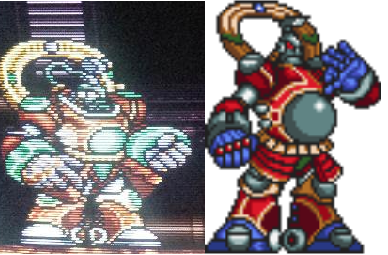 Its design is probably just a coincidence though as, while it does indeed look like the W from Dr. Wily's logo, there's some minute differences as well. Quite fascinating. Prototypes certainly have some stories to tell. Thank you to everyone that was involved in this. How does one enter these par codes in ZSnes without getting the "Error! Invalid Code" message? While it doesn't directly answer your question, I can confirm that the ones I tried worked in SNES9x without issue. If you're trying to enter the first code listed, add a 7 to the beginning (7E1FAE0C). Protodude made a typo. Otherwise, just enter the 8-character codes in the first line (next to where it says "Enter Code:"), add an optional description (next to where it says "Description:", and either hit Enter or click "Add". huh... there's no link to download? You can drop down this hole on Toxic Seahorse's Stage. In the retail, this hole is just a normal death hole, and is much wider. It looked suspicious with how small it was, but I was still surprised when I saw the camera transition. At first, I thought this might have been a scrapped area for a powerup, but voila, when you have defeated two bosses, this becomes another entrance to Vile's hideout! I am almost positive they scrapped this from the retail release. Nice find! I noticed that pit too but decided not to check it out lol. I was also wondering about Blast Hornet's ceiling door too. Is there a way to actually access it because even in the final version, GoldS never shared the PAR code to enable it. With how the level is laid out, it doesn't even make sense why it's there in the first place. You can only enter the door from above, and it will bring you back into Blast Hornet's room, where the game will effectively lock up. I don't know how GoldS did it originally (his codes appear to be superior), but this will at least get you through the door. Unfortunately there is nothing up there. Interestingly, the door is also present in Blast Hornet's refight room in Doppler stage 1. Why would they put a door there if you're going to be teleporting into the room? 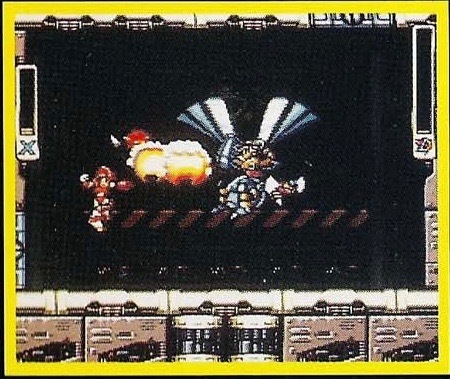 I personally think that as the only flying boss, Blast Hornet was probably supposed to enter the room through the door, which explains it's present in both rooms. This would also explain the lack of any other objects or terrain above Hornet's room, and the lack of any pathway to the door. Thanks Will! That was.......really interesting lol. Also thanks to CrAzY for mentioning the Acid Seaforce Vile Teleporter room. I went to check it out myself and added it to my document. The background of Toxic Seahorse stage is like of final version! 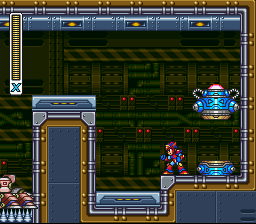 You're to realize that the background of the Seahorse's Toxic stage is different in the pictures from the Mega Man X3 SNES Box. Maybe there is another prototype with this detail.